Yesterday I posted about The Rose's first birthday party. It was a grand 'ole time. She is still recovering. Correction: We are still recovering. Today I'm trying to get ahead and be productive, so I'm writing thank you cards, and I wanted to share a fun and cheap idea that still is super personal. 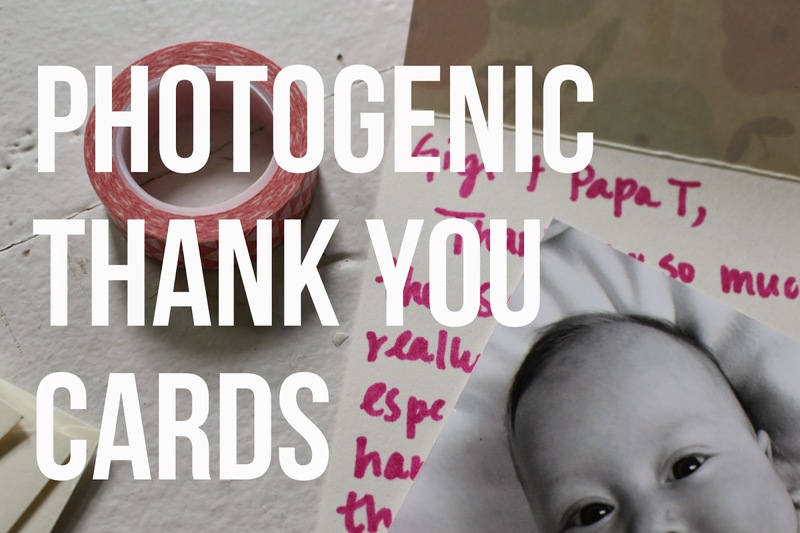 One thing you could do is order photo thank you cards. Those are super cute and I definitely drool over them online, but those are also a little pricey and they require you to think ahead. (That is something I don't always do). Instead you can include your own photos! For The Rose's birthday party we printed off many of our Instagram pictures from Walgreens and hung them up all over our home as decoration. (And psst! We waited until they had a coupon code and got them all for 40% off)! Then, after the fun day, we took the photos down and included a few of our favorites in our thank you cards. It was especially personal when we were able to include pictures of those specific guests with our little Rosie. It helped out in two ways: one, it helped us get rid of some of those photos (because we don't need ALL of them forever) and two, it allows our guests to have photos of Eliza to hang on their fridge. Double whammy! And by the way, I totally had to scrub my white floors for these photos. They were dirty! I need to clean them all. But that's for later. Now is for coffee drinking and news watching. Happy Tuesday!